Are you thinking about having your fuse box replaced in Columbia Heights? Replacing your fuse box with a circuit breaker panel makes your home safer, adds value to your home and makes your home easier to sell down the road. You may also be able to lower your insurance premiums by replacing your fuse box with a breaker box – check with your insurance provider. 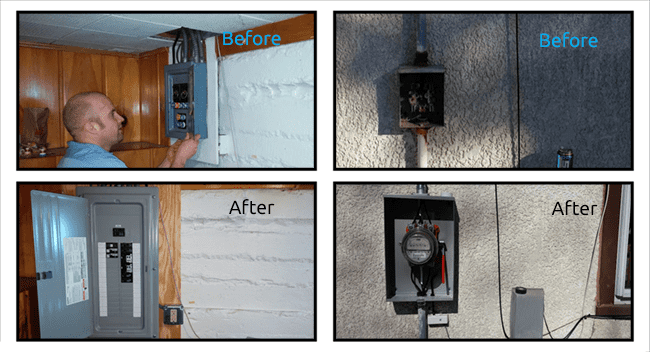 Many times when an electrical box is replaced or upgraded, the electric meter and the wiring outside needs to be replaced due to disrepair or power company requirements. In addition, your grounding electrode system will need to be brought up to current code. A good electrical contractor knows these things, and will divulge these details, along with the costs associated – before any work begins. At Edison Electric, the total cost of a job is never a mystery and is always explained to you in detail prior to work so you can make an informed decision.